Pawperty: 17 puppies, oh my! 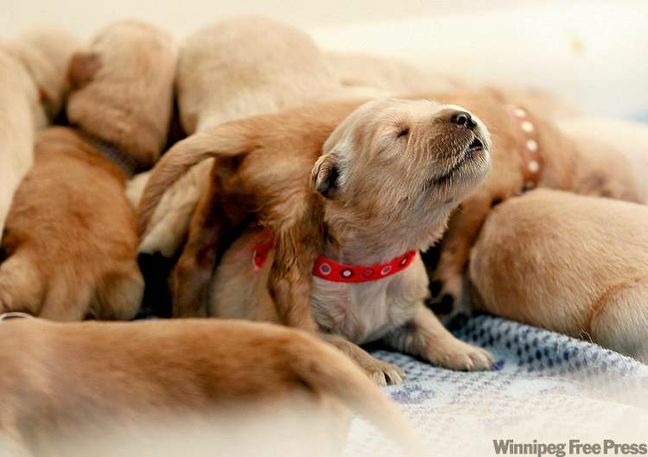 A record 17 puppies was born to a Golden Retriever in Winnipeg September 1, 2010. According to the Canadian Kennel Club, it's the largest single litter ever had by a Golden Retriever in Canada. Per the owner, all the puppies are "thriving." 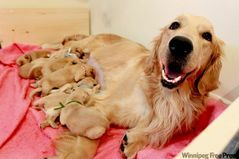 Giselle, the Golden, is nursing her pups every 2 hours while her owner Dinah bottle feeds the other half. At the 2 hour interval mark, they switch. "It's very time-consuming." But well worth it, said the owner. Just wait another 4 or 5 weeks when they all start running loose!